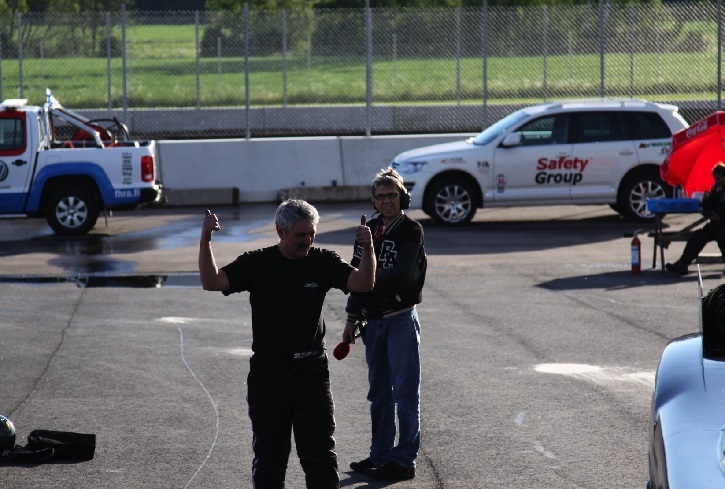 After winning the first round at Santa Pod we are looking forward to race at the nice state of the race arena at Tierp, in Sweden. On Friday nice weather for the first qualifying day. In the first round Danny made a gread run. 0.91 at sixty feet; 3,75 at the eight and 5,696 at the finish! This meant a new personal best and finally a 5,6! The weekend looked promising. In the second outing of the day Danny put a 5,79 sec on the boards with a speed of 403 km/h. No improvement and third qualifying position at that moment. During the evening the team did a complete check-up on the car. Unfortunaley the weater on Saturday was not to good and it kept on raining till late in the afternoond. No racing on day 2. Sunday also didn’t start to well. It stopped raining around noon and the track crew did a great job in drying and preparing the track as soon as possible. So finally at around 3:30 eliminations could start. In the first round Danny was against Jonnie Lindberg. With a time of 5,92 sec. Danny defeated Jonnie. In the semi-final Danny met Jurgen Nagel. A consistent 5,95 sec. put Danny in the final against LeifAndreasson, who set a new European record of 5,55 sec. and 417 km/h. In the final Danny ran a 5,91 and ended up as runner-up. But after the finish line the chutes didn’t deploy. Danny could not stop the car in time and went into the gravel trap. The funny car flipped. Luckely Danny was OK, but the car was heavily damaged. The new chassis was broken and the body was severely damaged.On the way home we left the body at Dan Larsen and his team, they offered to take care of repairing the body. Thanks Dan, Joan and team, what will we do without you guy's!!! The team returned home with mixed feelings. Still leading the European championship in points but without a car for the next races. First the team has to find out what will be possibel before taking new decisions. We would like to thank the safety crew at Tierp for the help after the crash. And finally we thank our sponsors Iso-Mobile, Rico Tools, Marcover, and Speedshop Belgium for their support.